For more than 34 years, and with the help of community partners, financial donors and volunteers, Puget Sound Kidney Centers has been the leading provider of comprehensive kidney education, social services, nutritional counseling, and dialysis services to those impacted by kidney disease in Snohomish, Skagit and Island counties in Washington state. We’re small but growing, and as we grow we stay true to our values and goals, focusing every day on improving the quality of life of those with kidney disease. Our patients are our top priority and our mission and vision statements reflect this. As guidelines for our organization and our staff of 225, these statements set the foundation for our work with kidney patients in the Puget Sound region. To enhance the quality of life of those with kidney disease through outstanding dialysis care, education and community support. To be the leader in the field of improving the quality of life for people and families affected by kidney disease. We were founded in 1981 to make dialysis services more accessible and convenient for patients in northern Washington state. We provide 91,000 dialysis treatments to more than 500 patients each year in six centers, at home and in area hospitals. Our Foundation raises funds so our patients can get care they wouldn’t get elsewhere – access to free classes, expensive nutritional supplements or a monthly bus pass, for example. We work in collaboration with partners in the medical community to deliver excellent care and patient support services. Our clinical teams, made up of nephrologists, nurses, dialysis technicians, dietitians and social workers, treat dialysis patients at our six dialysis centers and at local hospitals, and support and train patients who wish to give themselves dialysis at home. Our administrative staff members keep our organization operating smoothly, and members of our Foundation raise money for additional patient services that wouldn’t be possible without the support of financial donors in our community. As a patient-centered, community-based nonprofit, Puget Sound Kidney Centers is committed to ensuring that all patients and their families receive high-quality, convenient, compassionate and affordable care, a deep and long-lasting commitment we’re proud to make to the communities we serve. In-center dialysis: Patients undergo in-center hemodialysis treatments, usually three times a week for about four hours at a time, in one of our six dialysis centers in northern Washington state. Creating a comfortable and welcoming environment with state-of-the-art equipment, each of our centers has a dedicated team of nephrologists, nurses, dietitians, and social workers who support the total healthcare needs of our kidney patients. Home dialysis: Many patients want more flexibility with dialysis. We offer training and support for peritoneal dialysis, both continuous ambulatory peritoneal dialysis (CAPD) and continuous cyclic peritoneal dialysis (CCPD), as well as training and support for home hemodialysis using NxStage technology. 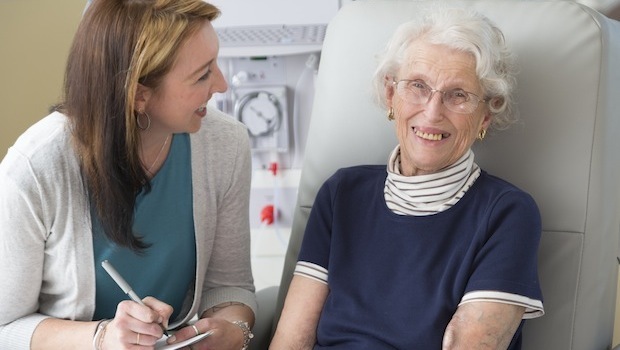 Home dialysis patients receive support from dietitians, social workers, financial administrators and other support staff, just as our in-center patients do. Hospital dialysis: We provide local hospitals with in-patient dialysis services for patients needing dialysis care while in the hospital. Classes and outreach: Since kidney disease often shows no symptoms before it’s quite advanced, being diagnosed can be overwhelming. We offer a number of education programs to help patients and their loved ones prepare for dialysis. These include free classes, for those recently diagnosed, covering an overview of kidney disease and treatment options, as well as community outreach about symptoms and ways to prevent kidney disease. Nutrition counseling: Our team of licensed renal dietitians provides kidney patients with nutrition counseling and education. Patients learn how to manage their diet and live well with kidney disease. Patient support programs: Professional medical social workers work with each of our patients, ensuring each patient has the support they need to manage physical, financial and emotional needs. We also connect patients to a patient support group and mentor program.